¶ 2 Leave a comment on paragraph 2 6 My own experience has followed the less tidy model. I start with a hodge-podge of vaguely-formed questions of different magnitudes, and interesting and seemingly relevant source material to explore. It is in that exploring that some questions come to seem more relevant, important, or productive than others. Others fall away entirely. And my writing is similarly non-linear, as I move between pieces of narrative, using writing as a way to find our test out what I am arguing, what glues the pieces of the story together. The big, driving question I am addressing becomes clear only gradually, often long after the evidence-gathering and sense-making, and well into the writing process. ¶ 4 Leave a comment on paragraph 4 5 I suspect I am not the only historian who feels that they are engaged in the work of research and writing unsure of what their final product will be. Once at an archive, while taking a break, I stood at the snack machine alongside a senior historian. She sighed, explained that she was embarking on a new project, and said that she was reliving how hard it is to be at the point where you don’t know anything yet. How, then, do we how do we proceed to do research –the real nuts and bolts of it – if we acknowledge this uncertainty? How can we organize information, keep it accessible in ways that will facilitate our ongoing thinking, if we are driven not by a single hypothesis, but changing focal points or areas of interest? ¶ 5 Leave a comment on paragraph 5 2 This essay recounts my own dissertation research process. I make no claim to have been a model historical practitioner or to have used particularly cutting-edge research methods. Speaking about research process requires careful attention to many, sometimes minute, details, and thus of necessity I draw on the story I know well. I hope this example can be a provocation to discussion and reflection. I first lay out how I organized my research process and how this process related to my thinking and writing. Then, I venture some connections between that research process and questions in the social history of knowledge and the scholarship of the archive – questions about the making and impact of categories in thought. ¶ 6 Leave a comment on paragraph 6 0 In the summer of 2006, I had a viable dissertation prospectus, and was about to embark on the first of my research trips. And I was scared that I would forget things. I knew what it took to manage the information involved in a seminar-length paper. Earlier, I had filled hand-written notebooks and compiled pages of word-processed text, later filtering through them as I built an argument. But what of a project that would extend over years of research and writing? Where, in the most literal sense, would I put all of the information, so that I could find it later? I needed something that would back-stop my own memory, allow for flexible organization, and yet be as accessible as possible. I also wanted to make sure I kept information in the context of its originating source, and that my notes clearly distinguished between what came directly from the sources and what came from my own thinking about them. ¶ 7 Leave a comment on paragraph 7 4 I turned to a relational database program, following the example of some more senior graduate students and one faculty in my department. (FileMaker Pro was my choice, like those in my department; there are a variety of alternatives now, some more streamlined (like Bento), some free and web-compatible (such as Zotero ), some designed for qualitative research (NVivo, AtlasTI ). 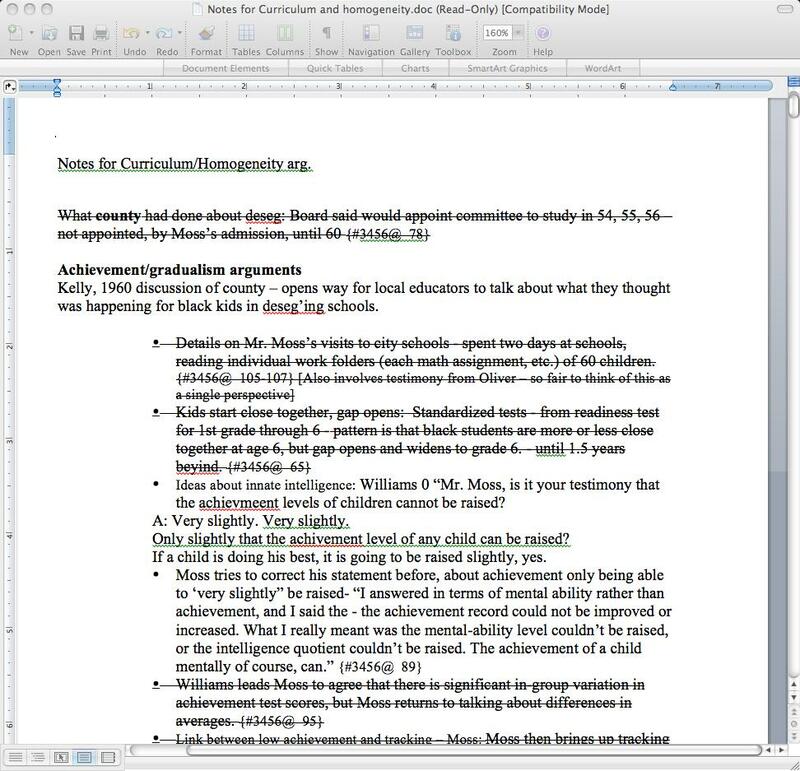 I created two notetaking layouts, one for sources, and another related one for notes from those sources. (You can download a template of my layout). Guessing at how I might later hope to sort and analyze my notes, I put in a keyword field. I set up about 15 key terms that I expected to show up a lot in my research – state, for state-level policy, for example, or vocational, for vocational education, or McGavock, for one high school that I thought would figure prominently. ¶ 9 Leave a comment on paragraph 9 0 Figure 2: Filemaker layout for taking notes, automatically populated with content from the source layout. ¶ 10 Leave a comment on paragraph 10 0 Although many aspects of historical notetaking are similar to working with other kinds of data, some are distinct. Dates are a good example. Database programs often have standard date formats, which assume or even require a precise, complete date for each entry. This structure does not accommodate easily sources that have vague or partial dates, yet still need to be able to fit (at least roughly) into chronological sorting. I worked around this by entering dates into a text (rather than standardized date) field and formatting dates in a way that worked if I had full information or not. Jean Bauer’s essay in this volume explores this point further. ¶ 11 Leave a comment on paragraph 11 0 Figure 3: I used a YYYY MM.DD format, which allowed FileMaker to sort chronologically even if I had sources with only the year, or only the month with no specific day, specified. ¶ 12 Leave a comment on paragraph 12 2 In trips to several archives over a year, I collected tens of thousands of pages of documents by taking digital photographs of these. I read and took notes on a portion on site, in those collections that prohibited digital copying or charged exorbitantly for physical copies. Because I had very limited time to work onsite at archives, most of my note-taking happened once I was back at home. I read digital copies on one screen while entering direct quotes, my own observations and questions, and tentative analyses, into the database layout on the other screen. The vast majority of my notecards were descriptive, but when I had a thought that tied portions of my sources together or hinted at an argument, I made a new notecard, titled “memo to self,” and then these entered the digital stack as well, tagged with keywords. 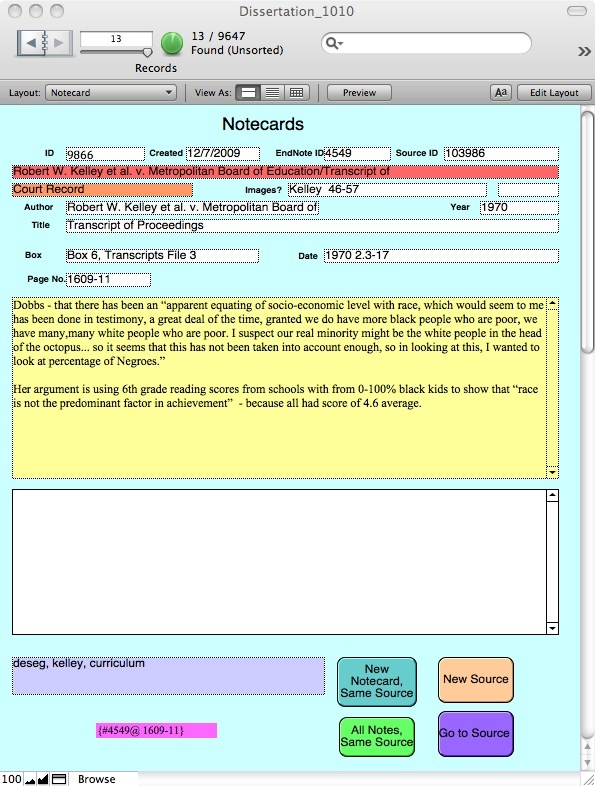 ¶ 13 Leave a comment on paragraph 13 0 Figure 4: Sample image of archival material, this a portion of a court transcript of Nashville’s school desegregation suit, here from 1970. ¶ 15 Leave a comment on paragraph 15 0 Once I had read through nearly all of my documents, I had nearly ten thousand note cards. I used the database as I began my analysis and sense-making. I first ran large searches based on my keywords: hundreds of notecards on vocational education, for example. I organized these cards chronologically – an action that takes only a few keystrokes – and spent a day reading them through in that order. As themes or patterns began to emerge, or there were connections to other sections of my research that weren’t under the “vocational” heading, I ran separate searches on these, and would incorporate that material into the bin of quotes and comments I was building by cutting and pasting into a new text document. (Databases often have “report” functions that could help this process, but I did not explore that route). None of this process, of sorting information into relevant groups, has to happen with a database. But I found it to happen quickly and more easily with one. ¶ 17 Leave a comment on paragraph 17 0 Having used the notecards in this way to reorient myself to my research material and sources, I began to write. I started to write before I was sure of the precise structure of the chapter or my detailed argument. I used writing as a way to find and refine my argument, rather than simply presenting it.3 Crafting a basic narrative often helped me identify what I was missing, what I needed to find out more about. I tried to keep moving in my writing by thinking, “who did what, when, and with what result?” Then, why? Writing in this exploratory fashion, I often needed bits of information that may not have made it into the first batch of notecards I was working with, so it was easy to flip back to the database and get those pieces when I needed them. ¶ 18 Leave a comment on paragraph 18 1 Using a relational database did accomplish the most basic of my goals. It proved a reliable and convenient way to keep notes and contextual information in the same place, and it addressed my most basic fear of forgetting by allowing searches for information in myriad ways – by title, content of notes, direct quotations, keywords, dates. ¶ 19 Leave a comment on paragraph 19 0 It was once I began to write, though, I came to appreciate how the database’s full-text searchability allowed me not only to follow my original questions, but to explore ones that I had not anticipated at the start of my research. 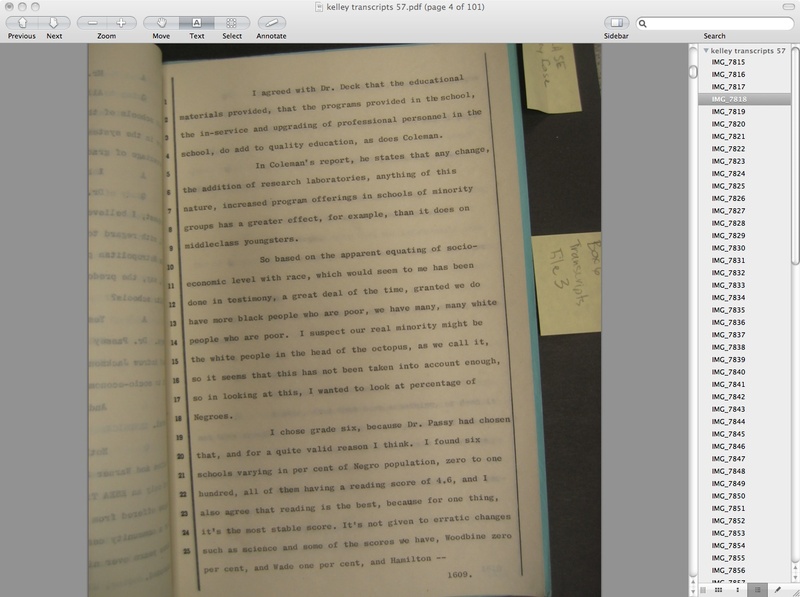 This digital mode of notetaking I chose allowed me to see things as I wrote and thought that I would not have seen otherwise – likely only because of the difficulty of tracking down notes without such a database. ¶ 20 Leave a comment on paragraph 20 0 Let me illustrate this with an example. One central problem in my work has been understanding the multiple layers of inequality at work in Nashville’s desegregation story. There are of course salient and central differences by race and by class, but these divisions were often expressed in the language of geography. By the mid-1960s, residents, planners, and educators used the phrase “inner city” to indicate predominantly black neighborhoods, or neighborhoods where planners anticipated that the black population would continue to grow. I had noticed this pattern in my own reading, and captured examples of such language and other descriptions and imaginings of geographic space and with a keyword – cognitive map, as I chose to label it. When I went to read about this phenomenon, I read through all of my “cognitive map” notes, in chronological order, and over several iterations of conference papers and draft chapters developed an argument about how what I called pro-suburban bias informed Nashville’s busing plan. In early versions, I seemed to imply that in Nashville residents’ cognitive maps, the correlation between suburban space and white residents, and urban space and black residents, was absolute. But I wondered whether there were exceptions to these generalizations made in imagined landscapes. What could I do to test this? It occurred to me that I could read all of the instances where my sources used the phrase “inner city.” Of course, I may not have not written down every single instance, as I did not imagine this textual analysis to be a part of the project from the outset. Nonetheless, I had enough to provide a basis from which to work. ¶ 21 Leave a comment on paragraph 21 0 When I read my sources in this way – some of which I had labeled as about “cognitive maps” and some of which I had not – I saw something that I had not fully noticed before. 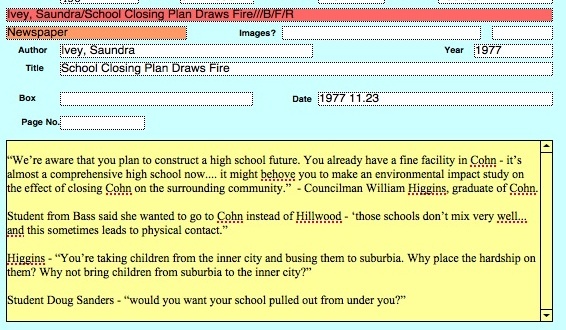 Among the critics of schooling in the “inner city,” and the smaller group of its defenders, there was a case that proved that the identification of urban space with black residents was not complete, at least for some city residents. I had made earlier notes about, but had not remembered to come back to, the story of a central-city school that was historically segregated white, remained largely working class, and had a local council representative fighting to retain the school in conjunction with what he labeled its surrounding inner city neighborhood. William Higgins, the council representative, asked, “You’re taking children from the inner city and busing them to suburbia. Why place the hardship on them? Why not bring children from suburbia to the inner city?,” and later proposed that “All new schools … should be unified with the inner-city, otherwise the city finds itself a lonely remnant, disunited and eventually abandoned.”4 When I read these passages, in the first years of my research, I had not thought to tag it as about “cognitive maps.” Thus they did not show up in that keyword search when I began my writing over two years later. I was able to discover them again because I could use a broader search based on a phrase laden with meaning and insinuation. Doing so yielded access to notes and sources that became quite important in my understanding how categories of race, geography, and class overlapped, and where they diverged, in my story. (Other essays in this volume explore the utility of full-text searchability in digital archives; the tool is useful as well within own notes in digital form). ¶ 23 Leave a comment on paragraph 23 0 In another case, I found that the database allowed me to reframe an initial research question about school location into a broader one about the distribution of public goods – schools and otherwise – in the metropolis. Such a topic links my work to the broader matter of what political and economic structures support metropolitan inequality. From the start, my dissertation was centrally concerned with why schools were built where they were, how locations got chosen, to suit which interests. I understood that in this way schools were a kind of good being struggled over in political and economic terms. But it was not until I was through the process of analyzing the local politics of school construction that I understood that my story was not just about schools, but about the distribution of public goods generally in the metropolitan area. ¶ 24 Leave a comment on paragraph 24 0 I had been tracing how urban renewal funds subsidized school construction, and how, in the context of a metropolitan government, such subsidies could allow a municipality to shift more of its own tax revenues to its suburban precincts. I suspected that this use of urban renewal dollars to reduce the local commitment to supporting city areas in favor of suburban ones was visible in other areas of city services as well. How could I illustrate that, provide some evidence for this broadened claim? I could see what my sources – planning reports, maps, records of community meetings– said about another kind of public good, to see if the dynamics were similar. I knew that I had made some notes about the building and repair of proper sewer lines for the city and surrounding suburbs, but I had not expected to write about them, so I had no related keyword. Text searchability of the database meant that I could very easily track down everything I had about sewers, organize it chronologically, and test if the pattern I saw for schools fit for sewers as well. Without fully searchable notes, I would have been looking through stacks of notecards, organized to fit another set of categories entirely. I may not have felt I had the time, at least at this stage of research, to expand my original question to a broader one. ¶ 25 Leave a comment on paragraph 25 0 In each case, the database helped relevant information jump out of the noise of years of research and thinking, and helped make that information available relationally, easily connected to other information. It is possible that I am overvaluing what the program did, however, as my appreciation of it comes from contrasting its use with other approaches I have taken before. Other researchers may have developed other approaches to keeping their own systems of information-gathering, digital or otherwise, flexible. Reflecting upon my use of this digital tool for notetaking has led me to questions about how we think about our research practice and how we understand the relationship between how we research and what we learn. Recent work in the social history of knowledge and the history of the archive share a core interest in categories – where they come from, what assumptions or values they represent, how they can be reified on paper or in practice. These interests are relevant to our thinking about research methods. In the writing of my dissertation, I felt fortunate to be able to set out initial categories of analysis (via keywords), but to have technological tools that made it possible, at no great expense of time, to throw these out. Sometimes I used my initial keywords, and sometimes I skipped over these to evaluate new connections, questions, or lines of analysis. If I had used pen-and-paper notebooks or a set of word processing documents, regrouping information would have required a great expenditure of time. I would have been less likely, then, to consider these new avenues, and thus my earlier thinking about categories of analysis would have been more determinative of my final work, even though those earlier categories were set out when I really did not know anything yet, in the words of that senior historian at the snack machine. Since there was virtually no time cost involved in trying out new questions, I could do so easily and in an exploratory fashion, without commitment. That is, thinking about how my database worked and how it helped my analysis got me thinking about how historians construct, use, and rely upon categories in our work. ¶ 27 Leave a comment on paragraph 27 4 It makes sense that historians would think about categories, as we encounter them in many ways in our work. As new graduate students, we learn to identify ourselves by sub-field – “I do history of gender,” or “I’m an Americanist.” And we are trained implicitly and explicitly to organize information and causal explanations into categories of analysis – race, class, gender, sexuality, politics, space, etc – when in fact these categories are never so neat and separate, whether in an individual’s life or in a historical moment. Then we research in archives that establish and reify their own categories – legal records divided by plaintiff or defendant, institutions that keep their records with an eye to confirming their power or reinforcing their independence. To make sense of a sometimes overwhelming volume of fact, all of which needs to be analyzed relationally, we rely on categories that we create as we work – like my database keywords. ¶ 28 Leave a comment on paragraph 28 1 This matter of categories connects to at least two fields of scholarship. Scholars of the history of knowledge like Peter Burke have examined the organizational schemes embodied in curricula, in libraries, in encyclopedias, and have shown us how these structures and taxonomies represent particular ways of seeing the world. Burke then shows that such schemes reify or naturalize those ways of seeing, helping to reproduce the view of the world from which they came. They also make some kinds of information more, or less, accessible. ¶ 29 Leave a comment on paragraph 29 0 Think, for example, of the encyclopedia. We are accustomed to its A to Z organization of topics, but this structure in fact represented a break away from previous reference formats that grouped subjects under a structure of classical disciplines. The alphabetized encyclopedia came about at a point when the previous disciplinary categories were no longer so stable as to be able to contain growing knowledge, and a new, more horizontal or less hierarchical model took their place, a model that allowed readers access to information by topic, outside of the hierarchies of a discipline.5 Burke points us to the importance of how we categorize information, where these categories come from, and how categorizations affect our access to and experience of information. ¶ 31 Leave a comment on paragraph 31 0 The work of scholars like Burke and Stoler poses important questions about how historians understand their own research process. Burke’s work suggests that we investigate how categories of thought, either between disciplines or within them, affect us. Think of academic sub-fields, for example, the boundaries of which still shape the literatures we read even as many try to transcend them, and still guide which archives we pursue or whether we think of particular questions as in or out of our domain. Stoler raises a different kind of question. At what points in our research, out of pragmatic necessity, out of a desire for intellectual order, or for yet other reasons, do we set out categories of evidence, of thought, that influence what we see and what we don’t see? What kinds of tools could help us be more aware of these categories, or have the flexibility to move beyond them when we need or want to? ¶ 32 Leave a comment on paragraph 32 1 I hypothesize here that relational databases offer a kind of flexibility in working with notes that can allow us to create and recreate categories as we work. That flexibility means that we can evaluate particular ways of categorizing what we know, and then adapt if we realize that these categories are not fully satisfactory. When I think of building categories as part of what I am doing when I research and analyze, I am reminded to evaluate those categories, those ways or organizing or thinking, for how they help or what they leave out. I have the flexibility to adjust my categories as I know more about my sources, about how they relate to one another, about how they relate to the silences I’m finding. I have tried here to illustrate this by talking about keyword versus full-text searching. ¶ 33 Leave a comment on paragraph 33 0 The matter of flexible categorization touches upon another strand of scholarship about archives, in which archivists debate what postmodernism has meant for their work. How does the growing understanding of archives as spaces in which certain kinds of power are codified and justified, and where information has to be understood relationally, matter for the practice of archiving? One archival theorist, Terry Cook, posited that finding aids and item descriptions should be constantly evolving, adapting to new relevant knowledge about the item’s sources and its relationship to other archived and unarchived materials.7 Working with relational databases provokes historians to think about how our notetaking and organizing practices may achieve this same level of flexibility and relationality. ¶ 34 Leave a comment on paragraph 34 0 Yet there are at least two cautions to think of, as well. One comes from the flatness of databases like the one I used. In Burke’s terms, my database is not a reference text organized along disciplinary lines. It was more like an A-to-Z encyclopedia. Without hierarchies that keep each fact locked in relationship to others – through the structure of earlier historiography, for example, or through the structure of an archive’s collections – the historian has to be more intentional about seeing information in its context. If we can look across all of our notes at a very granular level, and make connections across categories that we or others created, it becomes to easy to look at these bits of information devoid of context – a danger visible even in my own way of cutting and pasting out of my database, which linked bits of notes only to a source code, meaning that they could be read in less than direct connection to their origins. Digital bits seem very easily severed from their context. ¶ 35 Leave a comment on paragraph 35 1 More importantly, despite its usefulness in helping see things we might have otherwise forgotten or missed, no database does the work of analysis. The two are, of course, interdependent – and that interdependency exists in a digital or a non-digital form of notekeeping. The analytical work, the crucial sense-making that pushes history writing from chronology to critical interpretation, still happens in our own heads. And there, other implicit categories or habits of thought might be shaping our analysis. Here we decide whose stories to tell first, for example, or prioritize one set of historical drivers over another. Some of these habits reflect the deepest-held of assumptions and beliefs. It is less easy to talk of these, and certainly less easy for an author to identify their own, than it is to talk about notetaking and notekeeping. But, maybe if we are critically conscious of the mechanical, we can be prompted to more reflection about the conceptual, as well. ¶ 36 Leave a comment on paragraph 36 8 It is also worth considering what kinds of concerns may lead historians – even technology-saavy members of the youngest generation in the profession – to resist using digital tools like databases in their own research. The choice to use only word-processing files, for example, may stem in part from a concern about what might be lost in adapting a more mechanized information organization system. Charlotte Rochez, responding to an earlier version of this essay, explained that she worried about sacrificing “some of deeper insights, interpretations and understanding induced from being more involved in sorting and interpreting the sources.”8 Historians surely value, maybe even romanticize, the encounter with sources in the archives. 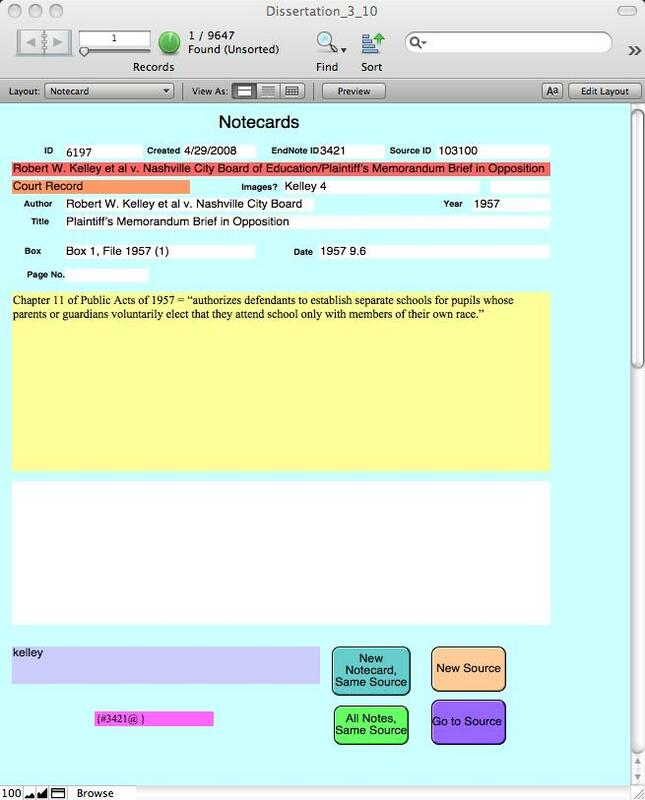 Does converting that textual, even textural, experience into digital notecards somehow deaden it? Does it render our research uncomfortably close to a social scientist’s coding and writing up of findings? It is important to clarify that digital notetaking may add to, but does not of necessity replace, varied encounters between researcher and sources. It remains possible to meander through your notes from a given collection or source, to look back at the original page (even if in pdf or photocopied form). But it becomes newly more feasible also to look across those collections and sources. ¶ 37 Leave a comment on paragraph 37 0 One prompt for this volume came from the Journal of American History’s 1997 special issue that made public the process of academic peer review. David Thelen’s introduction to that issue raised questions about the work of history-writing that seem important to revisit in light of digital innovations. The centerpiece of the issue was a submission by Joel Williamson, in which Williamson recounted his failure to perceive the centrality to, and the origins of lynching in, American and southern history. Two reviewers received Williamson’s piece with shock and dismay that he could have missed what they had known, had appreciated as central in their field, for years. Despite this disagreement, or perhaps because of it, Thelen saw Williamson’s piece as issuing a challenge to historians to “think about what we see and do not see, to reflect on what in our experience we avoid, erase, or deny, as well as what we focus on.”9 I see my attention to categories, to the possibilities and implications of how we choose to organize the information upon which our interpretations rest, as a kindred effort. ¶ 38 Leave a comment on paragraph 38 0 About the author: Ansley T. Erickson is Assistant Professor of History and Education at Teachers College, Columbia University. ¶ 39 Leave a comment on paragraph 39 0 Acknowledgements: The author thanks Jack Dougherty and Kristen Nawrotzki for the invitation to reflect on research practice and for good feedback on this essay, Courtney Fullilove for reading suggestions, and Seth Erickson for ongoing conversations about archives and information architecture. She also thanks all those who commented on the 2010 version of this essay. The dissertation research described here was supported by a Spencer Dissertation Fellowship, a Clifford Roberts/Eisenhower Institute Fellowship, and a Mellon Interdisciplinary Graduate Fellowship at the Paul Lazersfeld Center, Institute for Social and Economic Research and Policy, Columbia University. I think this essay might have a stronger impact if some of the material on “the problem of categories” — which, in this iteration, is mostly reserved ’til the end — were brought up near the beginning. I got through most of the essay thinking that the only benefit of the ‘digital notecards’ was that they allowed the researcher to manage a larger volume of notes. By the end of the essay, though, it became clear that there’s a more interesting argument here: by working with a large volume of sortable and searchable notes, the researcher could actually make conceptual strides in the interpretive work of the project — strides of a sort that might never have been made with non-digital note-cards. It would be nice to see a little more of that telegraphed in the beginning. The first two paragraphs talk about these issues (“the less tidy model”) but don’t actually explain how a digital technology can enhance or invigorate that mode of scholarship. I like this essay because it touches on a general problem for historical writing that historians simply do not address frequently enough: our methods. I have spent years working among social scientists in the Urban Studies Programs at the University of Wisconsin-Milwaukee and have been exposed repeatedly to their concerns about how we know what we know. Sometimes their emphasis on methods strikes me as silly (is coding really an important method) and sometimes as quite sensible (wasn’t my outlining of all my evidence a form of coding?). What is really important is that in their pedagogy and their scholarship, social scientists reflect on their method and practice. Historians, by contrast–because we are so interested in narrative flow, rarely do so. And this is our loss, I think. As I read Ansley’s essay, I kept wondering where the parallel essays for other periods in historical writing were. Where are the essays about the 10,000 print notecards (I vividly remember talking to Jim Grossman about his boxes of notecards while he pulled them off his shelf at the Newberry Library and showed them to me)? Where is my own essay about using a word processing program to outline my notes? As I teach the history methods class, I do look for essays that reflect in this way on historical practice and tend not to have found them yet. The best parallels I have encountered are Burton’s collection of Archive Stories, Banner and Gillis’s Becoming Historians, and Bruce Stave’s old interviews with Urban Historians. All of these are useful in their own way, but they do not yet get historians to a practice of critical reflection on methods that is standard in the social sciences. Or, perhaps, I simply have missed a large body of literature that I ought to know about. Thank you for these helpful comments. I think Christopher Hager’s connects with others by William Caraher and Charlotte Rochez below, asking for a clearer framing of this project within the field of digital humanities, or at least to foreground earlier what’s “digital” here. That makes a lot of sense. I appreciate Fred Gibbs’ comment, and it reinforces some thinking I’d been doing on what revisions I’d make if the essay moves forward. I was contemplating being more frank about how I am not someone who has been active in learning or using “digital humanities” methods, and who thus came to a relatively accessible tool not because it felt like doing something very new, but because it felt like doing something quite familiar in a better way. But in doing so, of course, I learned some broader things, as detailed here, and I want to encourage other folks who don’t imagine themselves to be at (or seeking) the cutting edge of digital history to still consider how these tools could work for them. With the opportunity to revise, I will cut this section because this date fix was highly imperfect. Rendering dates as text organizes months out of order (ex. 1, 10, 11, 12, 2…) – which I worked around as I read by paging manually, but something that more expert uses of this database software, or more granular and flexible approaches to dates (as that used by Zotero), would avoid. I think your ideas for a minor reframing are excellent and would really strengthen an already thought provoking essay. We support the thoughtful public comments your essay has already received, as well as your own proposed revisions in response to them (e.g. comments on paragraph 36). We would particularly like to underscore Caraher’s, Graham’s, and Burke’s concerns (paragraph 2) about the “tidy model” being a straw man, or at least a segment of a larger process which almost always incorporates “meandering” (a.k.a. playing, exploratory, or even “screwing around”) phases either before or in-between the committing of ideas to paper (or screen). Your own exclusion of evidence-gathering and sense-making from “the writing process” (where you write: “The big, driving question I am addressing becomes clear only gradually, often long after the evidence-gathering and sense-making, and well into the writing process”) suggests that the divisions you set up between different “models” of historiographical research and writing, as well as between different phases of your own modus operandi are not self-evident. You may well need to define “writing process”, especially if your definition includes research and sense-making as preludes to it but not part and parcel of it. In addition to polishing typographical and formatting errors, we ask that you add references where needed, for example: a complete reference is needed for Peter Burke’s work referred to in paragraph 28 and later; details should be provided for “recent work” as pointed out by William Caraher’s comment on paragraph 26. Please do your best to incorporate these recommendations into your revised essay. According to the word count at the bottom of the WordPress editing window, your current essay is 5,085 words. In order to meet our obligations to the Press, your final resubmission must be reduced to 5,000 words. “using writing as a way to find out rest out what I am arguing” does not make sense. Perhaps ‘using writing as a way to find out what I am arguing’? For what it’s worth, I think all historians proceed through their research in this way. Just some historians regard the formal research project beginning at a different stage than others. Surely students of history can only arrive at the kind of focused research so often described in books on method and methodology through a more iterative and “meandering form” of research. You might also be interested in Stephen Ramsay’s piece for “Playing with Technology in History”, on ‘The Hermeneutics of Screwing Around; or, What You Do with a Million Books’. @William – I like understanding this in terms of when we say that a project has begun – that is, whether the meandering counts as part of the “formal research project” or not. @Shawn. Thanks for this suggestion – I look forward to reading. Just want to second William’s comment above. I’m not sure there is a “tidy model” that contrasts with this representation. It feels rather like a straw man. first part of sentence has extra words plus missing space after first hyphen. Try: How, then, do we know how to proceed to do research – the real nuts and bolts of it — or something like that. Perhaps too many hows? I look forward to reading the Ginzburg piece. Thank you. It might be pertinent, at the end of this paragraph, to make a more explicit mention of the ‘digital’ aspects in the substantive focus of your essay. Charlotte – Thanks for the concrete suggestion. Doing so here would help address Christopher Hager’s comment above, and relates to William Caraher’s at graph 26. I think it’s brilliant that you’ve made it possible to download a template of your layout. This is one of my favourite examples in this book of the greater practical utilities afforded by publishing in digital forms, particularly here for readers interested in exploring or adopting digital tools in their work. The virtual-hands-on opportunity you provide resonates in my mind with the possibilities Gibbs and Owens mention in their essay about the desirability and possibility of making methodological processes, tools and potentially data available for readers to explore. Charlotte – It’s thanks to Jack Dougherty that I sharing the file itself was a possibility. I wonder here if it might be interesting to think about whether the digital age encourages historians to move away from the hard-to-define inductive processes towards an approach which has more in common with what we think of as ‘grounded theory’ – given the use of memos, coding, categorisation and the emergence of themes and patterns. Though it ought to be noted that some grounded theorists take issue with digitized coding techniques. I see you touch on this later in paragraph 36 with reference to social science more generally. A formal definition of “relational” databases would be useful to many of your readers. “Recent work… et c.” feels like it needs a footnote. In fact, it would be very useful and interesting to see how you place your dissertation research process within larger processes at the intersection of digital tool and the discipline. I have a methods paper under work about my dissertation project and the use I made there of a database; that database had partly replaced a set of word processing documents, precisely because of the awful waste of time integrating new information across many files had become. If it would be any use to have a user case here, I can pass you a text. Jonathan – I would be interested in your description of this difficulty. Please do send. (Email available via the web link. Agreed that some citation of interest in categorization within “recent work in the social history of knowledge and the history of the archive…” would be of great interest and help to situate your methods. This really makes sense to me and something I have been thinking about (that is how to do it?) and you have given me a great deal to think about. I like your thoughts on categories and categorisation here. I agree with Peter Burke that the history of individual and social experience breaks beyond, and may be distorted by, compartmentalised categorisation. I find your discussion useful for relating such concerns to digitizing processes. Reference: Burke, P. (1992) History and Social Theory, Cambridge: Polity Press. Sorry, misuse of paste buffer: the link I meant is this one. Specific citation? This whole section, beginning in the previous paragraph, is nicely done — accessibly presented and key to your argument. The footnote says “emphasis in the original”, but there seems to be no emphasis in the text as quoted. Jonathan – Thanks. I’ve had trouble with the italics in the transfer from MSWord to WordPress. It should read… suddenly find themselves having difficulty thinking. This is an excellent point. Too often people think of categories as permanently fixed in the system. We can change them, but that change also requires reflection. This issue is essentially what the paper of mine that I mentioned above was about; I must cite you! I too used a relational database for my dissertation research. Recently, however, I’ve become more interested in developing categories not from my analysis or interpolation of a primary source, but from the source itself. In other words, automating the process of database production in a way the allows for new connections (that might be invisible to the historian who cannot look at sources simultaneously but only one at a time). After all, it seems to me that the break through of relational databases is that they can predict relationships and test them in a continuously iterative way (think: Oracle). Maybe this observation does little for this essay directly, but I think it continues your discussion of the location of the historian in the analytical process. As our research become more automated and dependent on new technologies, we are becoming more and more aware of our own place within an interpretative workflow. Our decision to “intervene” and transform a record from an aggregated primary source to a description to a interpretation is central to the link between our database, its categories, and our final synthetic (analytical) work. I like this suggestion of moving between and combining approaches or ‘encounters’. I feel this has links to Kathryn Kish Sklar and Thomas Dublin’s entry. More mundanely, sorry, typo: `saavy’ presumably for `savvy’. William – Thank you for this comment. At various times as I worked on my own research and wrote this essay, I considered what historians would do if ALL of their (at least written) sources were full-text searchable – thus allowing the “automated” process you are describing, and theoretically producing analyses that historians would have missed. I think that part of what I found worrisome about this image was my concern that it would have the opposite effect that you describe here – that somehow history produced this way would have a cast of “objectivity” as if there had been no decisions involved in looking across sources, and that historians would become less attentive to our place in that workflow. I like your idea that more “automation” can exist with more attention to our role, although I want that link to be strong, I am not confident that it would necessarily be. i love the comment about historians romanticizing their sources in the archives. spot on. and yet while many traditionalists see databases as overly reductive, they have no compunction about the distortion that goes into creating nicely defined chapters and tightly spun historical narratives. i think historians on the whole have not recognized that thinking of history as data does not mean forgoing nuance and interpretation. I think the very strong finding in the essay is one that is curiously enough not particularly about the digital, which simply yet another historian discovering through experience that the classificatory and categorizing schema that govern archives and reference sources have a very problematic relationship to the actual production of historical knowledge–that they sometimes produce a sense of what is “knowable” which is subverted when those categories are ignored or reworked by a researcher, in reading across an archive horizontally. I think the sense in which you discovered this partly through your experiences of classifying in digital notation is really compelling. But I don’t think there’s much evidence that there are many historians who resist using the kinds of tools you engage in this essay. This is an example of where the depiction of a kind of unnamed, invisible majority faction of anti-digital or un-digital scholars really does seem to me an invention. If we’re talking about something like “Facebook is both a valuable research tool and a site of the production of historical knowledge”, I think it’s reasonably fair to say that many practicing academics would disdain that view. If we’re talking, “FileMaker Pro notes are digital where word-processing files are not”, I don’t really get a sense that it’s the same kind of sentiment expressed in anywhere the same kinds of numbers. Thanks for this comment. I’d like to respond to the latter half, on the question of whether there’s “resistance” to using database programs of the sort I used. On reflection, my choice of the verb “to resist” may be too strong (and you’re right to point out that it’s silly to imply that a MSWord file isn’t digital). I agree that, in considering sensible-seeming database tools, there is nothing approaching the substantial concerns that come with, as per your example, using Facebook in historical research. Yet I do think that this volume should not assume that technologies – even quite familiar ones like off-the-shelf database packages – have met universal adoption. I have been struck by the extent to which many historians continue not to avail themselves of these tools. That impression comes from an admittedly very un-scientific sample – conversations with my peers (people 0-5 years out) in my own institution and others in my subfield, and with the 20-person discussion group at a conference in which I presented an earlier version of this paper. In that forum, no one, young or old, was using anything other than MS Word to keep her notes. These encounters have led me to puzzle over both why it is that such valuable tools may be under-utilized – because of lack of knowledge, furthered by the dearth of talk about the nuts and bolts of research in many grad programs – but also to ask if there is, if not resistance, at least some reluctance involved as well. That’s the core question this paragraph was targeting, and I hope to have the chance to revise it to emphasize that query. As I’ve read through the various essays and comments, I think this kind of discussion raises a question for how this volume conceives of its audience. Is the purpose to move forward those already enmeshed in various kinds of digital scholarship, or is it also to try to bring in those who haven’t yet tried to connect these tools to their own work? I hope the volume can keep space open for the latter, and I hope to try to write about my experience in a way that doesn’t create a strawman of the anti- or un-digital while yet acknowledging a range of experiences and ways of thinking about these tools and their relationship to nuanced historical practice.